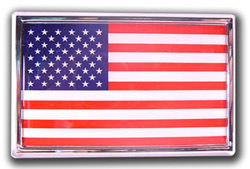 American Flag auto emblem. UV resistant dome flag set in metal chrome frame. We utilize double sided 3M automotive foam tape for easy, paint safe attachment. Made in USA. Shipping included.